Arango Insulation is the reliable commercial insulation contractor that Charlotte business and developers can rely on for prompt, professional service on virtually any structure. Whether you need to replace old fiberglass batts in the walls of your retail store or want to add sprayed roof insulation to your warehouse, our highly experienced technicians can quickly help you insulate your building. In fact, we’re widely recognized as one of the fastest commercial insulation companies in our region, providing next day service for many projects and completing our work in one to three days on average. We also offer a 1-year warranty on all of our work, so you can rest assured that we’ll complete your project with careful attention to detail so you stay on schedule and your building is up to code. With these exceptional products, we can provide an effective thermal barrier which can help you reduce the energy costs for your business. 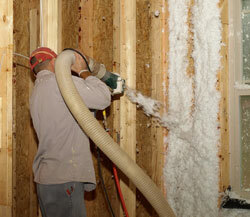 Arango Insulation also offers other expert services for commercial structures, including commercial roofing. To learn more about our commercial insulation services and the advantages of hiring a professional insulation contractor for your Charlotte, NC, area construction project, contact us today. We’re also proud to serve other commercial clients from Texas to Pennsylvania.